AWESOME LOCATION AND NEWLY RENOVATED including Air Conditioning! 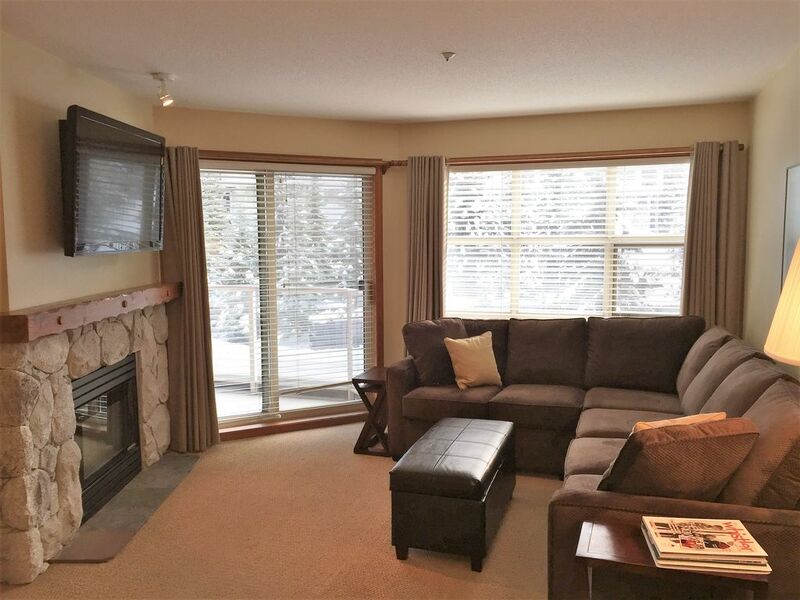 This one bedroom unit is in the Aspens on Blackcomb complex. The Aspens has an OUTSTANDING SLOPE-SIDE LOCATION, with true ski-in/ski-out access. Complementary SKI VALET is available during winter season. By skis, you can be at the Wizard Chairlift or ski school in less than a minute. A scenic stroll to Whistler Village for shopping and dining will take less than ten minutes. Year-round access to the complex's large HEATED OUTDOOR POOL, THREE HOT TUBS, and a fitness room. Please note that the pool is closed for refurbishment: September 10, 2018 to November 1, 2018. This unit is newly renovated. It includes: a fully equipped kitchen with granite countertops; a new 46 inch flat screen television above the fireplace with access to high definition channels and DVD player. Free WiFi access. The bedroom offers a flat screen TV and a KING SIZE bed for a good night's rest. The living room includes a QUEEN-SIZED SOFA SLEEPER. Secure underground pay parking is available. If you need children's items: high chair, pack-n-play, etc. we can help to get these items delivered to the condo. We live in North Vancouver, just 90 minutes from Whistler. We enjoyed Whistler as kids ourselves and are now sharing this experience with our two boys! In the winter we ski, then in the summer we cycle the trails and kayak on Alta Lake. Our family loves vacationing in Whistler year-round. The access to bike trails and lakes in the summer and amazing skiing in the winter has brought us here for years. We are thrilled to share our vacation retreat with your family! You don't get a better location than The Aspens on Blackcomb! True ski-in/ski-out. We can come back home for lunch. We love the amazing pool and hot tubs - so funny to see the boys have a snowball fight in the pool! Fully equipped, fridge, stove, dishwasher, microwave, coffee maker, toaster, kettle, pots/pans, blender etc. Great location, well equipped unit. Perfect location for ski in ski out. Ski valet service is a plus. Unit had everything needed. Very clean, nice view from patio. Excellent bed, good hot water, good appliances, comfortable couch, fireplace worked well. Owner very accommodating and good communication. No hesitation in recommending this unit. Very clean, quiet and well furnished. Have already booked same time next year. Great to hear that you had a great stay! Thank you for booking again! Close to new Blackcomb Gondola! Great ski in/ski out location, easy access to new Blackcomb Gondola! Short walk to Upper Village. Quiet and well furnished spacious suite ! Thank you for choosing our condo! We look forward to your next visit. We do our best to have the condo very clean and well stocked. Thank you for choosing our condo again! We look forward to your next visit! We just completed another great stay at Aspens and Cheryl’s Unit. Love the true ski in/ski out location and with the New Blackcomb Gondola right outside your door....even better. Condo very well stocked and king bed very comfortable.